First, a recap of the Opening Night Street Party. One word: AWESOME! Check out photos here. Special thanks to Nutcase Helmets for hosting the rad photobooth. Showings tonight are at 5, 7, 9pm. The box office opens a half hour in advance. Cash only. $8. Clinton Street Theater. Filmmaker Q+As are after the 5pm show. Stick around to hear from some amazing filmmakers like Kevin Sullivan, who produced the remake of LCD Soundsystem’s Drunk Girls video featuring a cadre of Portland bikers and tall bike jousting. 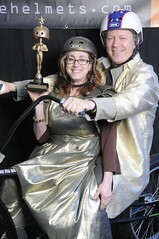 The Golden Helmet Award, presented by Nutcase, will be presented tonight at the 7pm show. Stick around to see who wins the top honor of the festival and a $250 cash prize.